Are you taking a city break to Lisbon anytime soon? If so, check out our guide to Lisbon's Metro - one of the most reliable and quickest ways to travel around the capital. With 4 underground lines and 55 stations, sightseeing, shopping and eating out across the city has never been easier. Make sure to get a copy of the Metro map on your first day in the Portuguese capital, or take a look online before you go, that way you can plan your journeys and save time while you're there. The Lisbon metro was opened in December 1959. At first, it had only one short connection route between Baixa, Jardim and Zoologico. In 1995 this was expanded, with the introduction of a second line giving travellers more travel opportunities between the capital's hotspots. The red line was added in 1998 - this provided quick and easy travel to Alameda station where the ultra-modern exhibition grounds created for Expo 98 are still located. It was only in September 2013 that the fourth line was introduced, an extension to Portelo Airport that aimed to provide easy transfer options from the airport to the red line, which then connects to all other lines. The Lisbon Metro has a total of four lines colour-coded red, blue, green and yellow. The red line, as mentioned above, connects to Expo Park, the airport and the other lines. The green line is where to head to explore the tourist area in Baixa, where you can enjoy sightseeing and sample some traditional Portuguese cuisine. 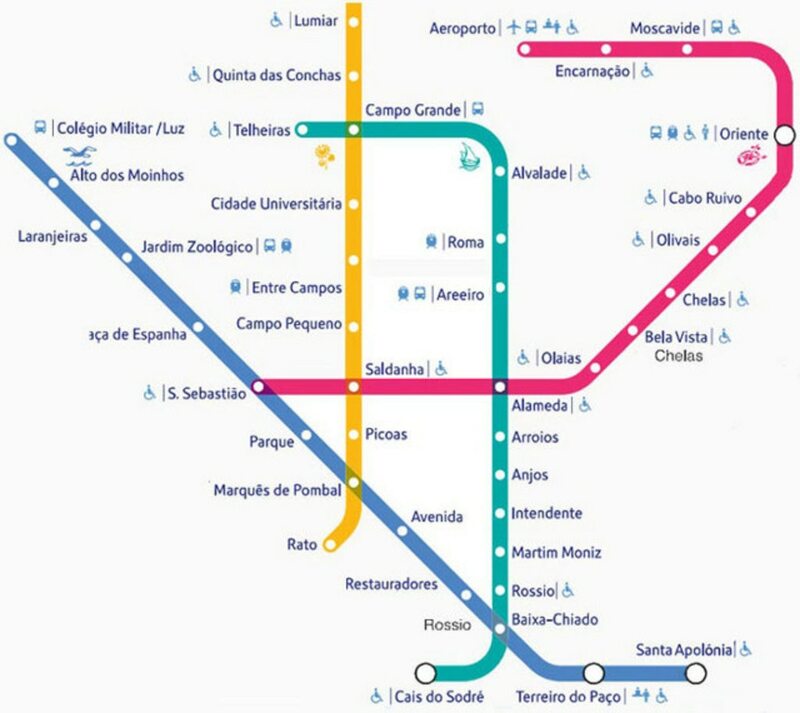 The yellow and blue lines can be used to travel to and from Lisbon's main avenues in the north region of the capital. Although these areas are less visited by tourists, these streets give you a glimpse of how the locals experience Lisbon - worth visiting if you fancy a more 'off the beaten track' type of visit. The Metro is the recommended means of travel from the airport to central Lisbon. For only 1.40 Euro you can take the metro to Saldannal station (the financial centre of Lisbon) in only 15 minutes. For connections to the green line take the metro to Alameda, and to Sabestio for the blue line (see above). You'll find a Metro station within a 5 -10 minute walk of most hotels, so simply find out which station is closest before you plan your journey. €6.00 - 24 hour unlimited travel, which includes all Lisbon buses and trams. These fares are loaded on a Viva Viagem card which can be purchased with your first ticket for €0.50. Make sure to keep your receipt after purchasing your tickets just in case there's a problem with your Viva Viagem card. Be prepared to swipe your card to go through the barriers when getting on and off the Metro trains. Metro trains are very frequent, with one arriving every few minutes on average during peak times. Don't panic if you miss one, you can always jump on the next! The Metro opens at 6.30am and trains run until 1.00 am, so just double check you have enough time to catch one back to your hotel at night. 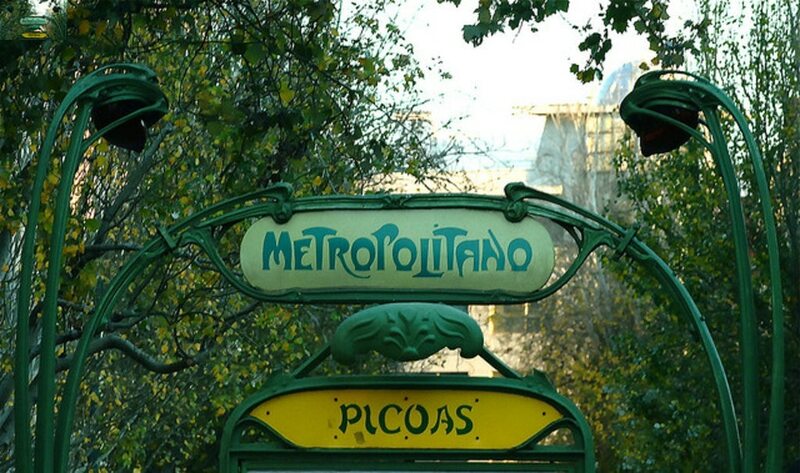 Have you used Lisbon metro before? Do you have any tips for your fellow travellers? Let us know in the comments box below. Images by Pedro and David, used under Creative Commons License. Overlooking Parque Eduardo VII, this contemporary luxury hotel is near Lisbon's historic center, the metro, and shopping areas, catering to both business and leisure guests. The Gulbenkian Gardens and Centre of Modern Art are nearby. Close to Edward VII Park, this luxury hotel in Lisbon is 500 metres from the Marques de Pombal monument at the top of the city's principal boulevard, Avenida da Liberdade. El Corte Inglés Shopping Centre and Calouste Gulbenkian Museum are also nearby. Luxurious contemporary hotel located in the heart of the trendy city of Lisbon and centered in the famous shopping district Avenida da Liberdade. Located in Lisbon City Center, this romantic hotel is within a 10-minute walk of Rua Augusta Arch, Lisbon Cathedral, and Santa Justa Elevator. Castle of Sao Jorge and Rossio Square are also within 15 minutes. This family-friendly Lisbon hotel is located in the business district, within 1 mi (2 km) of El Corte Ingles Mall and Gulbenkian Museum. Rossio Square and Santa Justa Elevator are also within 3 mi (5 km). Located in Campo Grande, this hotel is 0.8 mi (1.2 km) from Jose Alvalade Stadium and 1.9 mi (3.1 km) from Gulbenkian Museum. National Library and University of Lisbon are also within 1 mi (2 km). Located in Lisbon City Center, this luxury hotel is steps from Figueira Square, Rossio Square, and Santa Justa Elevator. Castle of Sao Jorge and Lisbon Cathedral are also within 1 mi (2 km). Must book the "Breakfast" rate category to qualify. Value limits may apply. Breakfast is offered in the hotel's restaurant; does not apply towards room service. Breakfast supplement for children age 12 or older must be paid directly at the hotel. May not include tax or gratuity. Valid anytime, subject to availability. Other restrictions may apply. This modern hotel is situated in a residential area a 5-minute walk from the Spanish department store El Corte Inglés, and 200 metres from the serene gardens of Lisbon's renowned Calouste Gulbenkian Museum. Welcome to the Holiday Inn Express Lisbon Airport, a brand new modern hotel, ideally located next to Lisbon International Airport and only minutes away from FIL trade fair venue, the Pavilh&rego Atlantico and Lisbon City Centre. Whether you&regre coming on a short business trip or to see the historical sights, you&regll find this &regBudget Hotel&reg perfectly adapted to both occasions.Lisboa Oriente, the closest train and metro station, is located a mere 5 min away (by car), and just next to it is Vasco da Gama Shopping Centre. Less than 5 miles away from the Hotel, you can find main attractions like the Lisbon Casino, the Oceanarium, Gulbenkian Museum and St. George&regs Castle with its astonishing views over the Seven Hills.The Holiday Inn Express Lisbon Airport offers twin bedrooms with 2 single beds for a maximum of 2 adults, and double rooms with a double bed and a sofa, where families of 2 adults and 2 children (under 18) can comfortably stay.All guestrooms are equipped with A/C, a spacious work desk, cable LCD TV and pay-tv, direct dial phone, hairdryer, ice bucket, en-suite bathtub, tea and coffeemaker (for complimentary use) and high speed internet access at a charge. Make yourself comfortable and kick off your day with an appetising complimentary continental buffet breakfast. We look forward to welcoming you! Book a stay in any room and rate category and receive a 10% discount in hotel shops, Galleries Mundial. Start to feel and live the Lisbon spirit in lx boutique hotel in absolute comfort and then live the experience of an ancient city and enjoy its singularity light and grace. At the lx boutique hotel you will find those small details thought exclusively to welcome you in absolute comfort. A distinctive elegance combined with an unusual simplicity touch involves you in a peaceful well-being that will make you feel absolutely at home. The charming melodious soft and unexpected decor also invites you to enjoy special days at the lx. Hospedar-se no lx boutique hotel e sentir-se imerso na alma da cidade de Lisboa. Com vista dominante sobre o rio Tejo e o laranja-avermelhado dos telhados este novo espaço hoteleiro encorpora a essência de uma cidade que funde a ancestralidade com a contemporaneidade. Lisboa e Tejo e Fado e o Bairro Alto Fernando Pessoa e as Sete colinas e a luz que penetra nas janelas e aquece o interior do lx boutique hotel. Located in Coracao de Jesus, this luxury hotel is within a 15-minute walk of Marques de Pombal Square and Rossio Square. Castle of Sao Jorge and Santa Justa Elevator are also within 2 mi (3 km). Located in central Lisbon, Hotel Tivoli Avenida Liberdade Lisboa is steps from high-end boutiques like Versace and Prada, and 2 blocks from Avenida Metro Station. Both Jerónimos Monastery and the Berardo Collection Museum, which holds works by Dalí, Picasso, and Warhol, are a 15-minute cab ride from the hotel. Located in Coracao de Jesus, this hotel is within 1 mi (2 km) of Edward VII Park, Gulbenkian Museum, and Rossio Square. Castle of Sao Jorge and Santa Justa Elevator are also within 2 mi (3 km). Located in Coracao de Jesus, this historic hotel is within a 15-minute walk of Lisbon Coliseum and Rossio Square. Santa Justa Elevator and Lisbon Cathedral are also within 1 mi (2 km).